I’m Matt, the originator of this picture and blog post on UES. This write up and statistical breakdown is eye-opening. As you said- it is definitely a white male centered graphic novel list. No doubt about it…I can do better. I wasn’t aware this had been shared around, but it doesn’t matter. The content does though. If you have a chance, I’d love to talk. Matt, I know you will do better. You obviously care about your students. But, I have to push-back on your statement that “I wasn’t aware this had been shared around”. The original post is on the “Snapshots” blog, a consortium consisting of mostly White teachers (1 African American who writes about math) who give content and teaching advice. You posted it to have is shared. You’re correct, I absolutely centered the “wasn’t aware” about myself when there was no reason to. Thank you for statistical analysis of that image- I have got do better. The information for the authors of March is incorrect. John Lewis is black, Nate Powel is white, and Andrew Aydin is of white and Middle Eastern descent. Black Panther has a creative team of two black men (Ta-Nehisi Coates, the author, and Brian Stelfreeze, the artist), but the series is more teen and adult readers imho. The illustrator of Moon Girl and Devil Dinosaur Natacha Bustos is Afro-Latina (http://remezcla.com/features/culture/natacha-bustos-moon-girl-and-devil-dinosaur/), but the two authors are white. The list is still very white. In your edit, you seemed to have cut out the race of protagonists graph, but the article is still there. dang it! Editing in WordPress is always a pain. Thank you! Thanks so much for this post. I’m curious if you can suggest any good lists for diverse comics/graphic novels. Recently transferred out of the school library but I noticed many teachers were a little flummoxed by the format and relied heavily on lists like the one in this post. 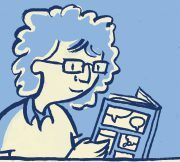 We’d gotten many of the graphic novels you recommend or those featured on AICL but I’m curious if there exists a list/review site I can point my former co-workers toward? It would be a really big help to have something that was grouped by or provided information on a suggested age/reading level, had various diverse groups featured, and of course didn’t include problematic books! There isn’t one. We need a site like No Flying, No Tights (really, that’s the name) to include critical reviews or critical content. If most graphic novels are written by white males and most authors write about what they know then it stands to reason that most graphic novels will be about white males. In order to increase the number of graphic novels about latinos or about gay people, transgenders, etc. we need more of those people writing novels. We can’t buy what isn’t written. Very true. Which is why WHEN something is written … like Lowriders In Space (great for elementary readers) it needs to be bought and shared.